Raumfahrt - A Private Rocket Likely Failed in Alaska — Why Is It Still Considered a Success? 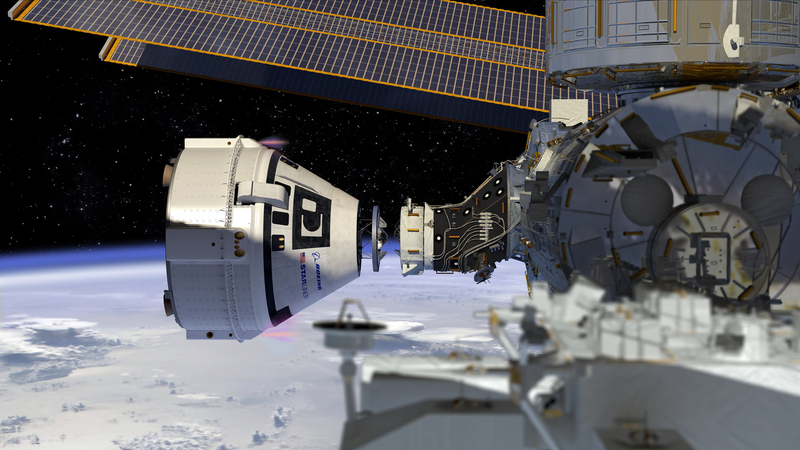 NASA’s Commercial Crew Program is working with the American aerospace industry as companies develop a new generation of spacecraft and launch systems to carry crews safely to and from low-Earth orbit – the SpaceX Crew Dragon and Boeing CST-100 Starliner. NASA will announce on Friday, Aug. 3, the astronauts assigned to crew the first flight tests and missions of the Boeing CST-100 Starliner and SpaceX Crew Dragon, and begin a new era in American spaceflight. NASA Administrator Jim Bridenstine will preside over the event, which will begin at 11 a.m. EDT on NASA Television and the agency’s website. NASA will announce the crew assignments for the crew flight tests and the first post-certification missions for both Boeing and SpaceX. NASA partnered with Boeing and SpaceX to develop the Starliner spacecraft to launch atop a United Launch Alliance Atlas V rocket and the Crew Dragon launching atop the Falcon 9 rocket, respectively. U.S. media are invited to attend the event at NASA’s Johnson Space Center in Houston and, afterward, speak with the astronauts about their assignments. Media wishing to attend must contact Johnson's newsroom at 281-483-5111 by 4 p.m. CDT Wednesday, Aug. 1. NASA introduced to the world on Aug. 3, 2018, the first U.S. astronauts who will fly on American-made, commercial spacecraft to and from the International Space Station – an endeavor that will return astronaut launches to U.S. soil for the first time since the space shuttle’s retirement in 2011. The agency assigned nine astronauts to crew the first test flight and mission of both Boeing’s CST-100 Starliner and SpaceX’s Crew Dragon. The astronauts are, from left to right: Sunita Williams, Josh Cassada, Eric Boe, Nicole Mann, Christopher Ferguson, Douglas Hurley, Robert Behnken, Michael Hopkins and Victor Glover. NASA introduced to the world on Friday the first U.S. astronauts who will fly on American-made, commercial spacecraft to and from the International Space Station – an endeavor that will return astronaut launches to U.S. soil for the first time since the space shuttle’s retirement in 2011. The agency assigned nine astronauts to crew the first test flight and mission of both Boeing’s CST-100 Starliner and SpaceX’s Crew Dragon. NASA has worked closely with the companies throughout design, development and testing to ensure the systems meet NASA’s safety and performance requirements. Eric Boe was born in Miami and grew up in Atlanta. He came to NASA from the Air Force, where he was a fighter pilot and test pilot and rose to the rank of colonel. He was selected as an astronaut in 2000 and piloted space shuttle Endeavour for the STS-126 mission and Discovery on its final flight, STS-133. Christopher Ferguson is a native of Philadelphia. He is a retired Navy captain, who piloted space shuttle Atlantis for STS-115, and commanded shuttle Endeavour on STS-126 and Atlantis for the final flight of the Space Shuttle Program, STS-135. He retired from NASA in 2011 and has been an integral part of Boeing's CST-100 Starliner program. Nicole Aunapu Mann is a California native and a lieutenant colonel in the Marine Corps. She is an F/A-18 test pilot with more than 2,500 flight hours in more than 25 aircraft. Mann was selected as an astronaut in 2013. This will be her first trip to space. Boeing’s Starliner will launch aboard a United Launch Alliance (ULA) Atlas V rocket from Space Launch Complex 41 at Cape Canaveral Air Force Station in Florida. Robert Behnken is from St. Ann, Missouri. He has a doctorate in engineering and is a flight test engineer and colonel in the Air Force. He joined the astronaut corps in 2000 and flew aboard space shuttle Endeavour twice, for the STS-123 and STS-130 missions, during which he performed six spacewalks totaling more than 37 hours. Douglas Hurley calls Apalachin, New York, his hometown. He was a test pilot and colonel in the Marine Corps before coming to NASA in 2000 to become an astronaut. He piloted space shuttle Endeavor for STS-127 and Atlantis for STS-135, the final space shuttle mission. SpaceX’s Crew Dragon will launch aboard a SpaceX Falcon 9 rocket from Launch Complex 39A at Kennedy Space Center in Florida. After each company successfully completes its crewed test flight, NASA will begin the final process of certifying that spacecraft and systems for regular crew missions to the space station. The agency has contracted six missions, with as many as four astronauts per mission, for each company. Josh Cassada grew up in White Bear Lake, Minnesota. He is a Navy commander and test pilot with more than 3,500 flight hours in more than 40 aircraft. He was selected as an astronaut in 2013. This will be his first spaceflight. Sunita Williams was born in Euclid, Ohio, but considers Needham, Massachusetts, her hometown. Williams came to NASA from the Navy, where she was a test pilot and rose to the rank of captain before retiring. Since her selection as an astronaut in 1998, she has spent 322 days aboard the International Space Station for Expeditions 14/15 and Expeditions 32/33, commanded the space station and performed seven spacewalks. Victor Glover is from Pomona, California. He is a Navy commander, aviator and test pilot with almost 3,000 hours flying more than 40 different aircraft. He made 400 carrier landings and flew 24 combat missions. He was selected as part of the 2013 astronaut candidate class, and this will be his first spaceflight. Michael Hopkins was born in Lebanon, Missouri, and grew up on a farm near Richland, Missouri. He is a colonel in the Air Force, where he was a flight test engineer before being selected as a NASA astronaut in 2009. He has spent 166 days on the International Space Station for Expeditions 37/38, and conducted two spacewalks. Additional crew members will be assigned by NASA’s international partners at a later date. NASA’s continuous presence on the space station for almost 18 years has enabled technology demonstrations and research in biology and biotechnology, Earth and space science, human health, physical sciences. This research has led to dramatic improvements in technology, infrastructure and medicine, and thousands of spinoff technologies that have improved quality of life here on Earth. The new spaceflight capability provided by Boeing and SpaceX will allow NASA to maintain a crew of seven astronauts on the space station, thereby maximizing scientific research that leads to breakthroughs and also aids in understanding and mitigating the challenges of long-duration spaceflight. NASA’s Commercial Crew Program is facilitating the development of a U.S. commercial crew space transportation capability with the goal of achieving safe, reliable and cost-effective access to and from the International Space Station and low-Earth orbit. The public-private partnerships fostered by the program will stimulate growth in a robust commercial space industry and spark life-changing innovations for future generations. 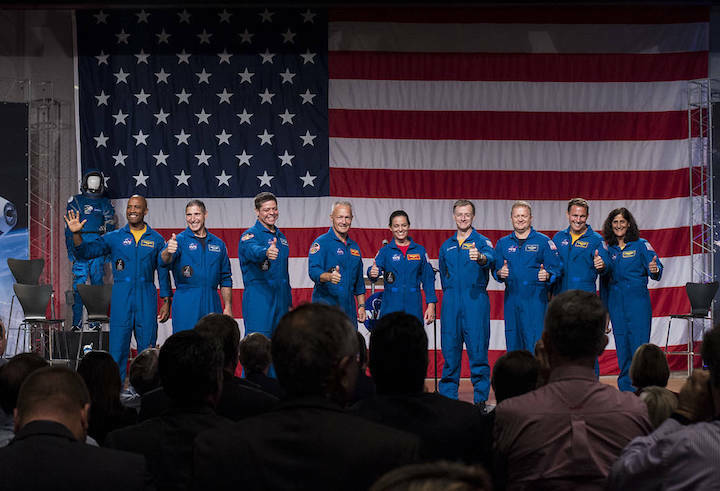 The first U.S. astronauts who will fly on American-made commercial spacecraft, to and from the International Space Station, wave after being announced, Friday, Aug. 3, 2018 at NASA's Johnson Space Center in Houston, Texas. The astronauts are, from left to right: Victor Glover, Mike Hopkins, Bob Behnken, Doug Hurley, Nicole Aunapu Mann, Chris Ferguson, Eric Boe, Josh Cassada and Suni Williams. 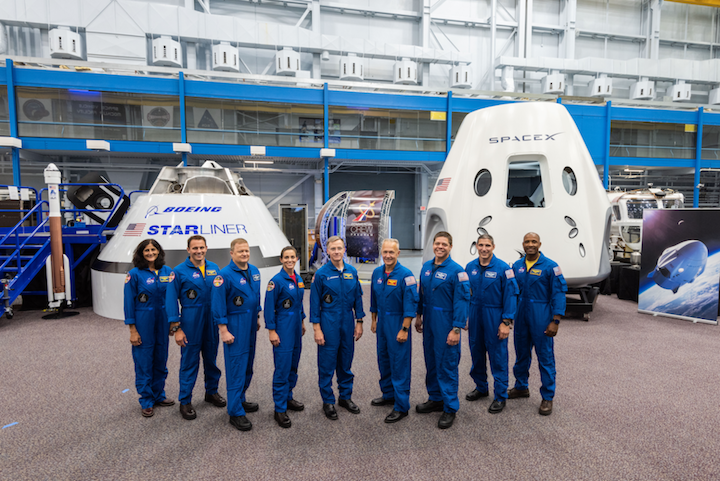 The agency assigned the nine astronauts to crew the first flight tests and missions of the Boeing CST-100 Starliner and SpaceX Crew Dragon. The first test flights for new spacecraft designed by commercial companies in collaboration with NASA to carry astronauts to and from the International Space Station from the United States are known as Demo-1 for SpaceX and Orbital Flight Test for Boeing. 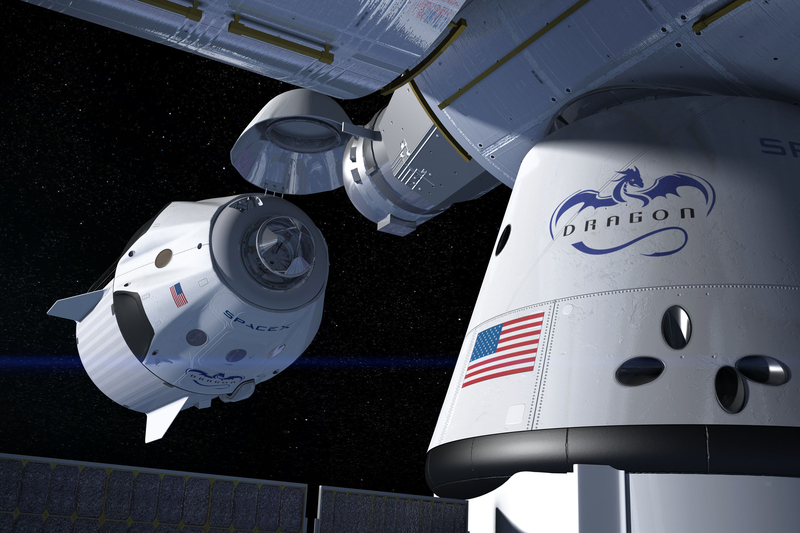 NASA’s goal in collaborating with Boeing and SpaceX is to achieve safe, reliable and cost-effective transportation to and from station on the companies’ spacecraft. Both companies have matured their designs, are making significant progress through their extensive testing campaigns, and are headed toward flight tests to validate their systems. An uncrewed flight test was not a NASA requirement for certifying these systems for human spaceflight. Boeing and SpaceX volunteered to perform these tests to demonstrate their systems are safe for crew. Each test flight will provide data on the performance of the rockets, spacecraft, ground systems, and operations to ensure the systems are safe to fly astronauts. Boeing’s CST-100 Starliner spacecraft will be launched atop a United Launch Alliance Atlas V rocket from Space Launch Complex 41 on Cape Canaveral Air Force Station in Florida. SpaceX designed its Crew Dragon spacecraft to launch atop the company’s Falcon 9 rocket from historic Launch Complex 39A at NASA’s Kennedy Space Center in Florida. NASA is making crew assignments now for the Boeing Crew Flight Test and SpaceX Demo-2 to support flight training as we return to launching our astronauts from American soil. As a partner approaches its target readiness date, NASA will work with the company and the Eastern Range to identify launch dates within the busy International Space Station schedule to ensure science investigations, as well as logistics activities and critical operations continue while these new spacecraft are tested. Many of the team members leading the unique public-private partnership believe the agency is on the cusp of something life changing with its Commercial Crew Program. The hardware for these uncrewed missions is being prepared for launch. Boeing’s Starliner spacecraft is being outfitted at the Commercial Crew and Cargo Processing Facility on the Kennedy and the United Launch Alliance Atlas V dual engine Centaur that will launch Starliner will be shipped to Cape Canaveral Air Force Station in Florida in August to prepare for the upcoming flight. Separately, SpaceX’s Crew Dragon spacecraft for Demo-1 arrived to the Cape in July for final processing. Falcon 9’s first and second stages for the Demo-1 mission are targeted to ship from SpaceX’s headquarters in Hawthorne, California to the company’s rocket testing facility in McGregor, Texas for additional testing in August. Once the uncrewed flight tests are complete and the data reviews have validated the spacecraft systems, NASA astronauts will have their first opportunity to fly in the spacecraft. Crew for Boeing’s Crew Flight Test and SpaceX’s Demo-2 flights will each include at least a flight commander and pilot aboard to test out the systems. These flight tests will have similar configurations to the uncrewed tests, but the crew will have the ability to interface with spacecraft displays, communicate with mission control, and practice manual controls during flight. Starliner and Crew Dragon will dock and undock autonomously to the space station before returning the crew safely home. After successful completion of the flight tests with crew, NASA will review flight data to verify the systems meet the agency’s safety and performance certification requirements and are ready to begin regular servicing missions to the space station.